Meet Fisher Bas: 12 years-old, growth-stunted, a geeky science genius, and son of the Nobel Prize-winning creators of the Bas-Hermaphrodite-Sea-Slug-Hypothesis. No surprise: Fisher isn't exactly the most popular kid in his middle-school, tormented daily by the beefy, overgrown goons he calls The Vikings. But he senses relief when he comes upon the idea of cloning himself--creating a second Fisher to go to school each day while he stays at home playing video games and eating cheetos with ketchup. 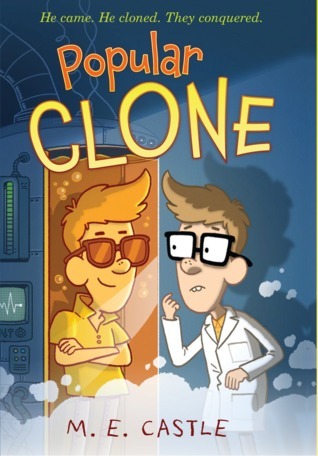 It's an ingenious plan that works brilliantly, until Fisher's clone turns out to be more popular than him--and soon after gets clone-napped by the evil scientist Dr. Xander. My daughters and I had so much fun reading this book. It's full of laughs, a few tender moments, science experiments, plans and diagrams, and a flying pig! I think this book definitely hit the nail on the head with it's wittiness, but real subject of bullying. Though the main character is a boy, I think girls and boys alike will thoroughly enjoy this story. With its strong descriptions, but not over the top explanations, everyone can enjoy the science-y aspects of the story without feeling bogged down. Fisher's amusing little doodles and lists throughout the book also add a dimension to the story that I rather enjoyed. You could see what Fisher was discussing rather than just read about it. I think that this book should be on school bookshelves and available for all kids to read. It was *that* good.